CHALLENGE: Development of the vacation packages section for Iberia.com, in order to display the offering of the Spanish Tour Operator Viva Tours. 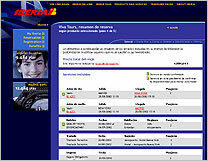 SOLUTION: Our usability experts designed the vacation pages of Iberia.com and its reservation engine, simplifying the booking process and making available the information and the contents required for the purchase decision. RESULT: From its launch, this new channel has been the largest source of growth and new business for Viva Tours.